Both sides in Ukraine's disputed presidential election have warned of a civil conflict, as tens of thousands of people continue to protest in Kiev. Opposition leader Viktor Yushchenko rejected the official results declaring Prime Minister Viktor Yanukovych as president, and urged a general strike. Outgoing President Leonid Kuchma called on world leaders not to interfere. US Secretary of State Colin Powell said Washington "cannot accept" the election result as legitimate. Correspondents say the opposition supporters show no signs of ending their three days of protests in the capital, Kiev. 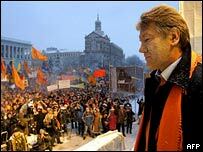 Calling for a general strike, Mr Yushchenko told a vast crowd of supporters in the central Independence Square that Ukraine was on the brink of a "civil conflict". Mr Kuchma, who backs Mr Yanukovych, denounced the opposition protests and warned civil war "could well become a reality at the present time". 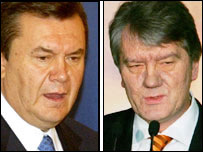 Mr Yanukovych, who has now declared himself the winner, offered to hold talks with the opposition leader. "We must improve our lives and we will do it together - all of our citizens and myself as president of Ukraine," he said in a brief appearance on state television. But a key member of the opposition team told the BBC that Mr Yushchenko would only negotiate with Mr Kuchma. The opposition said it would challenge the official result in the supreme court on Thursday. Refusing to accept defeat, Mr Yushchenko told his supporters: "We do not recognise the election as officially declared." He called for a national strike that would shut down schools, factories and transport networks. The pro-Western Mr Yushchenko, who claims the vote was rigged against him, called the election commission's official declaration "their latest crime". "With this decision, they want to put us on our knees," he told the crowd, which chanted: "Shame! Shame!" A host of celebrities have appeared on stage to show their support for the opposition. They included Ukraine's Eurovision Song Contest winner, Ruslana, who announced she was going on hunger strike until the opposition leader was declared president. A number of pro-government supporters were also visible on Kiev's streets for the first time on Wednesday, though eastern Ukraine saw pro-government rallies earlier in the week. The two sides have been trading taunts and pro-government supporters celebrated the official results by drinking champagne. Riot police have been on stand-by since the demonstrations began but there have been no reports of violence. In Washington, Mr Powell said Ukraine was at a "critical moment" and had to decide whether it was on the side of democracy. He warned of "consequences" for the US-Ukraine relationship, but he added: "It's still not too late to find a solution which respects the will of the people." The election commission said Mr Yanukovych won Sunday's second round vote with a margin of almost three percentage points. The commission had already indicated a win for Mr Yanukovych, but exit poll results had put Mr Yushchenko ahead. The US and the European Commission had urged Ukraine not to announce the result before reviewing the contentious vote. The new head of the European Commission, Jose Manuel Barroso, earlier warned Ukraine there could be "consequences" for its relations with the European Union, unless there was a serious and independent review. The Netherlands, which holds the rotating presidency of the EU, said it would send an envoy to Ukraine to discuss the disputed result. Neighbouring Poland has also sent a top foreign policy adviser. Western election observers and the Ukrainian opposition have reported thousands of voting irregularities, including a near 100% turnout in some pro-government strongholds. Earlier, Mr Yushchenko said he was prepared to have a re-run of the vote if it was run by "honest" officials.